I have a local guy selling a year 2000 Unisaw 36-829 with a 52” Unifence, extension table setup and its on a mobile base. 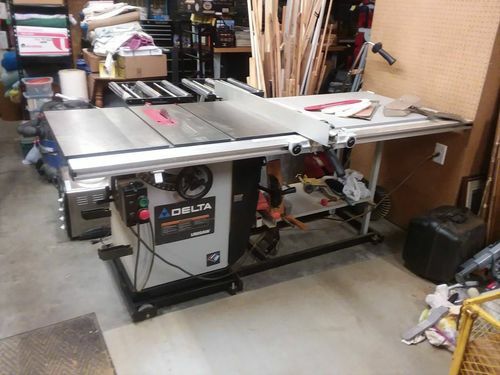 He says it was purchased for hobby woodworking and he didn’t use it much and is out of the hobby and moving. It seems to be in good condition. Not knowing enough about this saw, I was wondering if you guys would help me value it. I have been saving my pennies with the plan to buy a Grizzly hybrid 0833p, but if I get a good deal on this saw would be a better saw to get into? Pictures & price? I’m not a unisaw guy but there are plenty of those folks here who could give you feedback if you provide a little more info. Those saws are very well regarded. Nothing wrong with the 0833p either but the 52” fence, mobile base and ext. table certainly add value to the Unisaw. It’s a great saw, but you did leave out some details . I had a 2001 with a Unifence (that’s why I bought it) and it is a lifetime saw. So, how much does he want? So he’s asking $1500 right now. Its a bit above my budget of $1000 and I was hoping he would come down a bit. But I had planned on the 0833p when it was on sale for $950, and now that has gone up too! So, I was going to wait a bit and keep saving. People in the know around here are going to tell you that it’s overpriced and you should keep looking….that I guarantee. Where these “people in the know” find the “unicorn” above pictured saw for what some of them say they are worth….I’m not sure. This saw, in that condition, in my area, would probably go for at least his asking price, or probably more like $1900. I’ve seen it. But I digress…..
That saw, in the shape that it’s in, with the accessories, is every bit worth $1500, compared to the other saws that would compete. The 0833P, while a good saw….isn’t a Unisaw. The only other saw that compares is the Powermatic PM66, and I guarantee you wouldn’t touch that saw below $2k, unless it needed some work. The bigger Grizzly saws (New) will set you back that much, or more. You must live around me, i lI’ve in Olive Branch an have seen ad, but think it’s a little high. It’s been listed for a while now. If he dropped the price a little I’d look a lot harder. But I really don’t need a saw right now. Maybe Brad will chime in here before long he knows the value of that year saw. Most of my dealings are with old unisaws. That’s really a nice setup and would probably be the last saw you would ever need or want. If I needed one I’d try to get him down a little and buy it, if everything checked out and might pay 1500. Saws around here are not dirt cheap. It took me 3 years to find 2 uni’s. One for 700$ one for 450$. They are out there. It’s a matter of his long you are willing to wait, having the cash in hand, and doing your due diligence when looking for one. 1500$ is more than I’d pay but I’d buy it before a grizzly. The unifence is a huge plus. Ha ha..I thought that someone closer would chime in and would have seen that add. I actually live in Little Rock, but have family in memphis, so I looked there on a whim. I think I will go take a look at it when he is available. At $1500, I couldn’t get it now, but if he still has it in a bit who knows. I’m just another one who thinks you should jump on that. Even so, I do see him as being a little high. I bought pretty much that saw in 2001 with that base and it seems like I paid less than that new and delivered. Still, it’s in great shape form the pics and will last you a lifetime. Someone is bound to point out it’s a bad deal because it’s right tilt. That would not be me, I prefer RT to LT. Have you talked to him yet, maybe he’ll budge just a little? That is a pretty typical price… they sell all day long in that range ($1000-$1500) in that condition around here. But if your budget is $1000, offer it and see what he says. A lot more machine than the Griz, and the Unifence is a huge bonus. PS: I have both left and right tilt saws, and I prefer right tilt as well. Unisaws are great, but that one lacks a riving knife, I think. The uni is a right tilt…..but to me that is more desirable anyway….. I wouldn’t wait long….that one will be gone…..doesnt make much sense to wait in hopes of saving a few hundred bucks on a lifetime machine that also has excellent resale value. None had a riving knife until they were redesigned in 2009. But better yet, it will accept a disappearing splitter which is only available on right tilt machines. I asked and the onwner at one point told me he thought it did have a riving knife. One of the pictures had this in it..I cropped it so it’s a bit blurry. 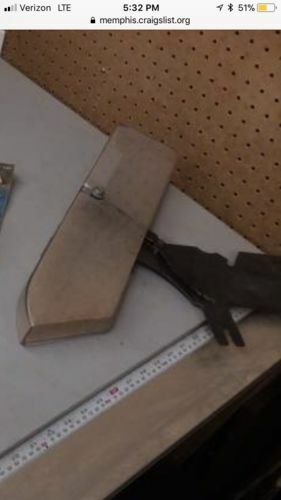 Is this just a blade guard? Looks like some sort of riving knife though! It’s a blade guard and splitter. It suffers from the same problems all such guards do: it’s far from the back of the blade, inconvenient to remove, and not usable for non through cuts. $1500 is high. I recently bought a brand new unisaw that was sitting in someone’s basement still on the shipping pallet for 15yrs for $1100.